Ubiñas: What if we found homes for homeless drug addicts? Dawne Enggasser, who has battled with drug addiction, is seen in her apartment in Philadelphia, PA on January 11, 2017. 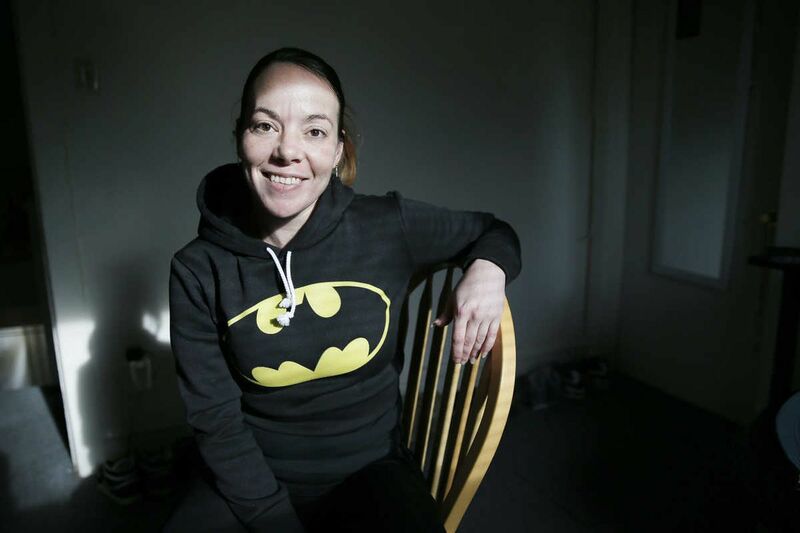 She has her own apartment thanks to a new program with Pathways to Housing, which is providing housing for addicts in hopes of getting them on the road to recovery. What if we housed Philadelphia's homeless drug addicts. What if before they got clean or even committed to rehab, we offered them a place of their own, away from the very streets where they chase their addictions. It's a controversial idea. Crazy, some might say. But definitely timely - as Philadelphia battles an opioid crisis that killed nearly 900 people in the city last year. Mayor Kenney recently launched a task force to address the epidemic. In the first-ever U.S. Surgeon General's report on substance abuse, released in November, Dr. Vivek Murthy issued a call to action and said it was time to deal with the nation's opioid crisis in a different way. Well, what Pathways to Housing PA is trying is certainly different. Finding homes for homeless people - often people with mental health or substance abuse issues, is what the housing-first program does. Mostly, successfully. But this is the first time that they've launched a team to specifically target those addicted to opioids. It's a risk, no matter how receptive the participants or how committed the team of counselors. Addiction breeds chaos, and that can lead to strained relationships with even the most understanding landlords. There are high rates of relapse, no guarantees, and plenty of room for judgment. You're going to give addicts an apartment - what are you thinking? But Pathways is betting it can work, and as uncomfortable as this idea is going to make some people, I think we should bet on Pathways. "Already, we've demonstrated that we were a great intervention for other people living with chronic homelessness and even some folks who were using opioids," said Matt Tice, Pathways clinical director. "But this gave us the chance to develop a specialized intervention exclusively serving this group." And it's not as if it's completely unproven. When someone is housed there are huge drops in individuals going to departments, psychiatric inpatient treatment, and prison. So far they've housed around 26 addicts, and have a budget to house 60. Dawne Enggasser is one of those people. Enggasser was just 13 when she became addicted to heroin. For 22 years, she's been in and out of rehab and prison. Prison is where Pathways' outreach workers found her. When they told her she was eligible for their program, at first she didn't buy it - she'd been on the streets long enough to know that nothing comes without strings. "At the very least, I thought it was some transitional housing or shelters or something. I figured, OK, tell me who I have to deal with, what hoops I have to jump through." But shortly after leaving prison in 2012, they helped her move into her own apartment, and connected her with a team of people ready to help her. "It was like someone else's apartment," she said. "It was everything, everything from the TV to a bed, from deodorant to toothbrushes to cleaning supplies. Everything I needed." She relapsed. But when she was ready to try again last year, Pathways was there, this time with a more targeted program. "We know recovery takes time for the individual but it also takes commitment to help walk them through the process," Tice said. When I recently visited Enggasser in her cozy Northeast Philadelphia apartment, she was optimistic about her future. There was still baggage to go through, the physical kind on her living room floor and the emotional kind she's working through with the help of counselors. But her kitchen is stocked; her makeup and sunglasses are arranged neatly in an over-the-door shoe organizer. And for the first time in "maybe forever," she said, she's learning to work through the feelings that once triggered her drug use. The foundation for all of her success, she says, is the stability of having her own place. She's getting counseling for underlying mental health issues. She's on Vivitrol, a non-narcotic monthly injection of naltrexone that blocks the cravings for heroin. When I tell her that some people won't get it, I'm not telling her something she already doesn't know. "We don't do that to dogs, we put dogs in shelters. So why not us? We're people, we're human. Don't we deserve a shot? " They do - and this is as good a time as any for Philly to take a shot on people who most need our help.